If Deadspin had a "LOLUFC" tag, this would be the perfect story to append it to. 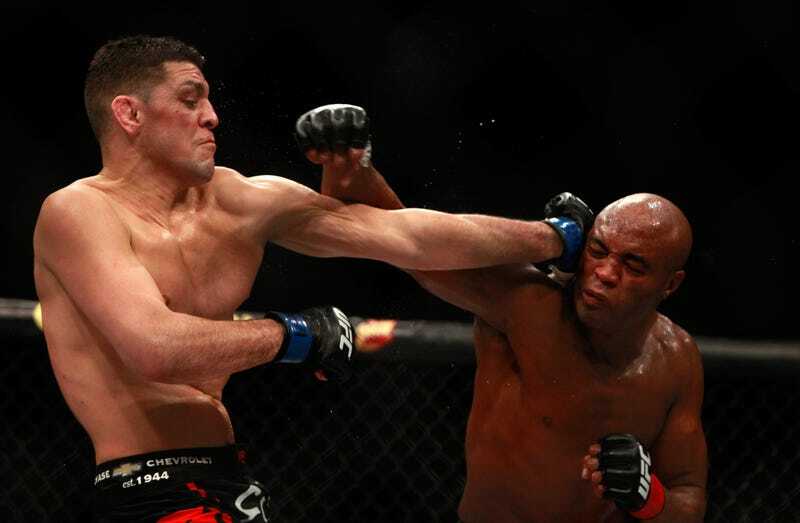 Anderson Silva—considered by many to be the best MMA fighter of all time—unanimously defeated Nick Diaz in Las Vegas at UFC 183 over the weekend, returning from a brutal leg break for his first fight in 13 months, and first win in 27 months. It was a big step in his attempted comeback at age 39, but it may have been his last one. On February 3, 2015, the UFC organization was notified by the Nevada State Athletic Commission that Anderson Silva tested positive for Drostanolone metabolites on his Jan. 9 out of competition drug test. UFC's understanding is that further testing will be conducted by the Commission to confirm these preliminary results. The "those" being referred to are the aforementioned Drostanolone metabolites, as well as another steroid, androstane. The UFC statement did not address the positive androstane test. The UFC has been notified by the Nevada State Athletic Commission that Nick Diaz has tested positive for marijuana metabolites following his fight with Anderson Silva at UFC 183 on Jan. 31 in Las Vegas, Nev. The UFC has a strict, consistent policy against the use of any illegal and/or performance enhancing drugs, stimulants or masking agents by our athletes. As a result of his positive test, Diaz has been informed that he has violated the UFC Fighter Conduct Policy and Promotional Agreement with Zuffa, LLC. The UFC organization will fully respect the Commission's final decision relating to Diaz at a disciplinary hearing set for February 17. Diaz was suspended six months in 2007 and a full year in 2012, both times after testing positive for marijuana. In 2013 the UFC raised the threshold for allowed marijuana metabolites from 50 ng/mL to 150 ng/mL, but Aguilar confirmed to ESPN that Diaz's results were above the new, more permissive standard. The Nevada State Athletic Commission will hold disciplinary hearings for both fighters in two weeks, and ESPN reports that both are likely to be temporarily suspended, with full disciplinary hearings to follow. Meanwhile, Cagewriter reports that the result of the fight will likely be ruled a no contest. What a disaster.